After two weeks, the love grows. ME: Hi, my name in Connie and I’m addicted to bikes. There are worse addictions. Spening money on bikes is an investment in your own power and the environment and I’d like to thank the Academy. I’m always looking at bikes. I’m obsessed. It doesn’t matter if they’re new or antiques, cargo or BMX, banana seat or Brooks: I love bikes. That’s my story. The whole thing started when my guy and I were discussing a trainer sort of bike system. I looked into the Peloton and with the price tag and subscription I was immediately turned off. “That’s the price of a really good brand new bike!” I lamented. Last year I looked at rollers (been there, failed at that) and other trainers. The weather improved and I didn’t have to make a decision, but here I was again. I have been watching for the Faraday Cortland for awhile. Not like, years-awhile, but since June. There were hints about a belt drive. I have been interested in a belt drive since 2009. But that’s another post. I think that an e-bike is a great way to get out and about whenever, but specifically in comparison to an exercise stationary bike why not put that money toward a bike that can at least go somewhere. Yes, I know, those simulations do look amazing, but I prefer being outside and in the thick of it all. I like my exercise to be part of my day. That’s me. Another selling point: the racks. I can carry cargo without feeling like I need a separate cargo bike. The front rack mounts to the frame and for me that means I can Faraday my cargo away. I have several decent hills near my house. An 8% with cargo and no assist is hard on my knees and frankly I just don’t like it. The Faraday assist is what I think a rocket booster must feel like. I feel very Jetson about switching into a level 1 or 2 pedal assist. Yes, pedal assist means you need to be pedaling to get the assist. My rig doesn’t have the matching racks at this writing, but as soon as they are available I will add them. I’m most interested in the front rack, but I think it makes sense to have both. Can we talk about the color for a moment? My favorite color is orange, but the copper crayon in the crayola box was my absolute fave. I didn’t really think much of this color. I knew I didn’t want the white, because well, white in the Northwest doesn’t seem like a good idea. In person, this blue is exquisite! It has some magic added in the mix and in the right bit of sun it is opalescent. How did they come up with this color? I didn’t think I’d like it from what I saw online, but in person—it’s heavenly. The Cortland doesn’t remotely look like an e-bike. Another aspect that earns it points. What an elegant bike with lines drawn simply and gracefully enough to feel like billows of fabric and tiny birds should follow my trails. If Snow White had a bike, this would be the one. If I was getting married, I would ride this down the aisle. Yes, my friends, this bike is sheer beauty. Oh, and the belt drive means I’m as quiet as shadow. All you can hear is the breeze and your tires on the pavement. There have been a few complaints about the creamy tires and again, I live in the Northwest, where it rains more than suns. The owner of the bike shop, Clever Cycles, mentioned that the disc brakes mean there’s less junk to rub up on the tires. I was out for a short ride today, so I’ll get back to you on that topic, but I don’t care. That’s a minor issue. I think when I do replace the tires, I’ll go with gray or black, but I don’t need to worry about that now. Bamboo fenders are chic, eco-conscious and they look so good. Will they hold up in the rain? I don’t know yet. I will wear them out and put on hammered metal fenders at some point. Bamboo looks amazing so we’ll see how they wear. Can we talk about the whole buying-the-bike experience? I went to my Faraday dealer, Clever Cycles. I love this shop. If I had a bike shop, it would be Clever. They all know their bikes and they are there to support the daily ride. It’s like Tiffany’s for bikes. 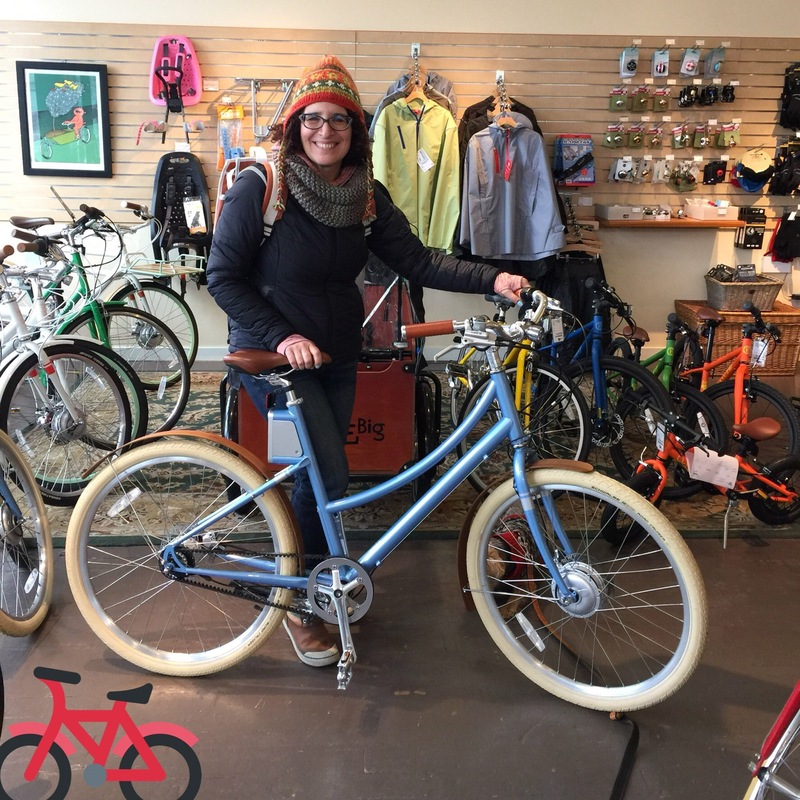 Plus, the bikes they sell are for a biking-centric lifestyle. I went in to test ride the Cortland, not really knowing what was available. Clever had the gray one and it was a blast. I rode it around several blocks getting a feel for the shifting and the assisting. The chain drive was great, but I couldn’t help thinking about the belt drive I saw online. I didn’t know the blue, belt drive was in the shop. I had seen the blue one online, but not in person so I was starting to assume that only the gray one was available. Until… There was one and they brought it up for me to try. It was for another customer, but the test ride made me even more confident that the belt drive was what I wanted. I didn’t take that one for a test ride since . They could have another one ready for me to try out by the weekend. Clever Cycles built one up and gave me a ring. A winter storm rolled in and I didn’t get to test ride it until Saturday. Despite the slick streets I had a fun test ride and was smitten from about the fifth pedal stroke. Belt drives are ninja quiet. Once I got back to the shop, the owner asked me how I liked the ride. I can’t remember what I said, but I think I said it was spectacular! My fate was sealed in that moment. I got a new bike for Christmas and my birthday and possibly next Christmas and my next birthday. An E-bike. E stands for exciting, excellent, entertaining, exhilarating, exceptional! It’s a Faraday Cortland. Yes, I think it is electric— perfected, just like Faraday says. But I’m calling her Lulu. More about my first 30+ mile ride with Lulu. Until then. Get out there and ride!